In The Legal Genealogist‘s family history, it is a signal event that we can ever say for sure where an ancestor was on a specific day. Oh, an ancestor who fought in a particular battle in a particular war, yes. Or occasionally a place of birth or a place of death. But an ordinary day in an ordinary life? A rare thing, for sure. Rarer still is the occasion when we can say for sure what an ancestor was thinking on a specific day, his ordinary thoughts about ordinary things. And one of those very rare combinations occurred 113 years ago today. We know where my second great grandfather Gustavus Boone Robertson was that day. And we have a small insight into what he was thinking. It was on that day, 113 years ago today, that G.B. (as he was called) sat down and began a letter. “Oct 1st 1903,” it reads at the top. In other words, a very small town in small-town Texas. The letter breaks there. It isn’t clear who the writer meant by “Parrish.” Mack Lee Parish had married a Robertson daughter, Nancy Arminta Robertson, in 1874,4 and had been left a widower with two children when she died in 1895.5 In context, Willy is probably Willie Parish, Nancy Arminta’s daughter. 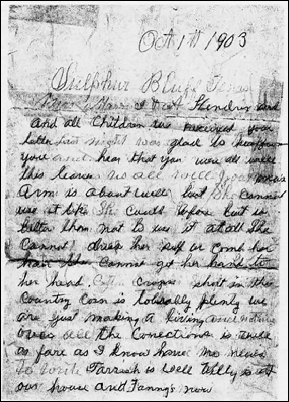 The letter breaks off again there and the rest of it is clearly written by someone else, most likely the youngest daughter Lillie, then a widow. But let’s see here what we got just in those few lines. First, we got G.B.’s birthday: subtract 76 from 1903 and we have him born in 1827. And an exact birthday — the 7th of November. Then we got the closest we can get to the exact birthday of my second great grandmother, Isabella (Gentry) Robertson: subtract 71 from 1903 and we have her born in 1832. And the 3rd or 5th or 8th of September. But this puts him there earlier than that: this puts him in Perkins, Oklahoma Territory, by October 1903. It’s just an ordinary letter, from an ordinary man in an ordinary time. And it is such an extraordinary piece of my family history. I’m so glad that you wrote about this letter! You write in a much more interesting way than I do!! How I love old letters. I have a treasure trove of them, copies various people in the family have kept, one that is all the way back to 1880s (they married in 1888 and it’s clearly a courting letter), and another set that was written before and during the Civil War, from a different side of the family. One of mine is so helpful as my gr-aunt writes of when several family members were born. I have typed up many of them and am working on doing a “cast of characters” and other info about things mentioned in one set of letters and then will share them with 2 of the historical societies that will be interested, I know. As one cousin said “letters make them real people that I can relate to, not just names and dates”. I am so happy that some of our letters were saved.